In Indian cooking, spices have great importance. 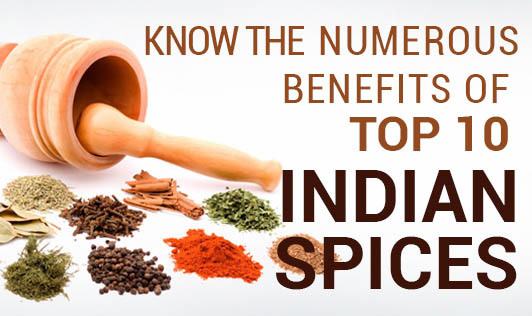 Spices not only give taste to the food but also have numerous health benefits. Know more about these mighty spices. Cinnamon: Cinnamon is aromatic and has a refreshing taste. Cinnamon ads spark to a bland dish. Cinnamon is a diabetes-friendly and it helps to reduce insulin resistance. The woody spice gives relief from indigestion, common cold, diarrhea and poor blood circulation. Saffron: Saffron is expensive but the health benefits are priceless. It helps to treat depression, improves memory and helps prevent loss of vision. It helps relieve digestive issues with the help of anti-inflammatory and anti-depressing properties. Black pepper: Black pepper has the ability to increase the production of hydrochloric acid that the stomach needs to help in digestion. It helps reduces blood pressure and contains iron that is beneficial for the body. Cumin: Cumin helps to get rid of digestive problems. It helps to reduce the problem of piles and provide the body with Iron, manganese that helps in the absorption of calcium and controls blood pressure. Turmeric: Turmeric has a bitter taste and is frequently used to flavor or color curry. Turmeric is used for arthritis, heartburn, stomach pain, ulcerative colitis, intestinal gas, liver problems etc. Carom seeds: Carom seeds also known as ajwain. These seeds are often chewed for medicinal purpose. These seeds promote digestion, cures stomach ache and help relieve tooth pain. These seeds are rich in calcium, protein, and fiber too. Cardamom: Cardamom is also known as Elaichi. It is the world’s most expensive spice. A rich source of Vitamin A, Vitamin C, Calcium, iron and zinc. It promotes heart health, helps in digestion, enhances oral health, fight depression, Diabetes and prevents blood clots and treats skin infections. Clove: Cloves contain anti-bacterial, anti-fungal properties. They are a powerhouse of antioxidants and they are rich in omega3 fatty acid, fibers, and minerals. It is the richest source of antioxidants. Asafetida: Asafetida adds a sharp taste to the dishes. It offers a few medical advantages. It helps in fighting asthma, bronchitis. It is used for digestion problem including intestinal gas, upset stomach etc. Black cardamom: Black cardamom contains a strong aromatic flavor and is a natural remedy for respiratory problems. It helps in stimulating and regulating the gastric and intestinal glands to secrete essential juices. Black cardamom contains anti-oxidative properties which help keep the scalp and hair strands nourished.